A new battery that runs on sugar has an "unmatched energy density", according to the team behind it. Other sugar batteries have been developed but energy density has always been the problem. There is a reason gasoline is still popular after 150 years and that reason isn't big oil marketing, it is that the energy density of gasoline is terrific. The energy density of this new battery is order of magnitude higher than others, allowing it to run longer before needing to be refueled, said Y.H. Percival Zhang, an associate professor of biological systems engineering at Virginia Tech. They believe the technology could progress enough that it could be running in some devices starting in three years. And they could be cheaper, refillable and biodegradable. In America alone, billions of toxic batteries are thrown away every year, posing a threat to both the environment and human health, according to the Environmental Protection Agency. Zhang's lab works on enzymes mixed together in combinations not found in nature. They have also published articles on creating edible starch from non-food plants and developed a new way to extract hydrogen in an economical and environmentally friendly way that can be used to power vehicles. The new technology uses a synthetic enzymatic pathway that strips all charge potentials from the sugar to generate electricity in an enzymatic fuel cell. Then, low-cost biocatalyst enzymes are used as catalyst instead of costly platinum, which is typically used in conventional batteries. Like all fuel cells, the sugar battery combines fuel - in this case, maltodextrin, a polysaccharide made from partial hydrolysis of starch - with air to generate electricity and water as the main byproducts. 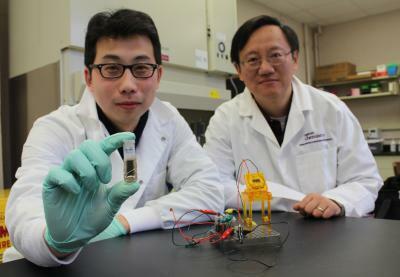 "Sugar is a perfect energy storage compound in nature," Zhang said. "So it's only logical that we try to harness this natural power in an environmentally friendly way to produce a battery. We are releasing all electron charges stored in the sugar solution slowly step-by-step by using an enzyme cascade."